As early as 1913, Russian clinical records from far eastern Siberia describe the human viral disease now known as hemorrhagic fever with renal syndrome (HFRS) (Casals et al. 1970). Dr. Ho Wang Lee (1982) found a Chinese medical account of a similar disease dating to about A.D. 960. This is not surprising in view of its unique renal complication and the fact that the etiologic agent of HFRS proved to be a zoonotic virus that causes chronic infection with urinary excretion in the murid rodent, Apodemus agrarius. This mouse is the most common wild rodent over much of northern and eastern Asia and often invades cultivated fields, gardens, haystacks, and sometimes human dwellings. Human conflict during the lethal 20th century also played a prominent role in elucidation of the etiology, clinical evolution, epidemiology, and ecology of HFRS. “Field nephritis”, which occurred in both allied and German troops in Flanders during World War I, may well have been caused by a hantavirus now known to occur in western Europe and Scandinavia (Bradford 1916; Arnold 1944). 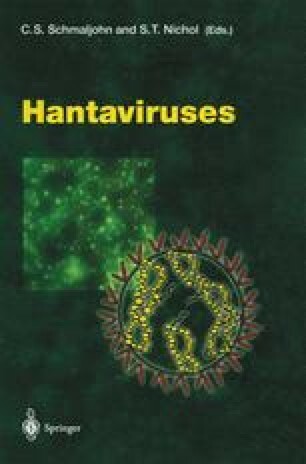 Japanese military physicians encountered the disease in the mid 1930s after invading Manchuria (Kitano 1944), Finnish and German soldiers were affected during World War II (Stuhlfauth 1943; Hortung 1944), and UN troops first encountered the original hantavirus during the Korean Conflict in 1951 (Smadel 1953).